23 December 2002: A Happy New Year! 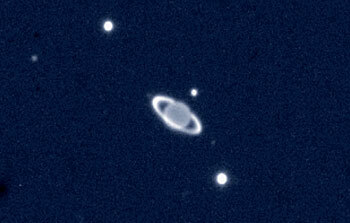 20 December 2002: Don't worry - you are not the only one who thought this was a nice amateur photo of planet Saturn, Lord of the Rings in our Solar System! But then the relative brightness and positions of the moons may appear somewhat unfamiliar... and the ring system does look unusually bright when compared to the planetary disk...?? Well, it is not Saturn, but Uranus , the next giant planet further out, located at a distance of about 3,000 million km, or 20 times the distance between the Sun and the Earth. 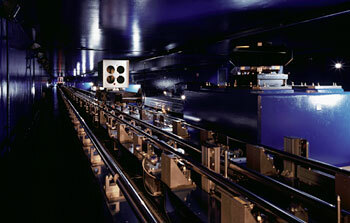 18 December 2002: Following several weeks of around-the-clock work, a team of astronomers and engineers from Germany, the Netherlands, France and ESO  has successfully performed the first observations with the MID-Infrared interferometric instrument (MIDI), a new, extremely powerful instrument just installed in the underground laboratory of the VLT Interferometer (VLTI) at the Paranal Observatory (Chile). In the early morning of December 15, 2002, two of the 8.2 m VLT unit telescopes (ANTU and MELIPAL) were pointed towards the southern star Epsilon Carinae and the two light beams were directed via the complex intervening optics system towards MIDI. After a few hours of tuning and optimization, strong and stable interferometric fringes were obtained, indicating that all VLTI components - from telescopes to the new instrument - were working together perfectly. Two more stars were observed before sunrise, further proving the stability of the entire system. The first observations with MIDI mark one more important step towards full and regular operation of the VLT Interferometer . They are a result of five years of determined efforts within a concerted technology project, based on a close collaboration between ESO and several European research institutes (see below). Now opening great research vistas, they also represent several "firsts" in observational astrophysics, together amounting to a real breakthrough in the field of astronomical interferometry. 17 December 2002: Imagine you are an astronomer with instant, fingertip access to all existing observations of a given object and the opportunity to sift through them at will. In just a few moments, you can have information on all kinds about objects out of catalogues all over the world, including observations taken at different times. 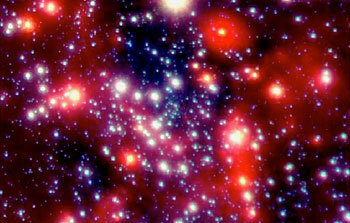 11 December 2002: An international team of astronomers  has made the deepest-ever near-infrared Ks-band image of the sky, using the ISAAC multi-mode instrument on the 8.2-m VLT ANTU telescope. 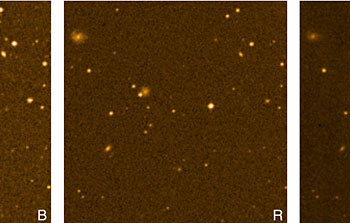 For this, the VLT was pointed for more than 100 hours under optimal observing conditions at the Hubble Deep Field South (HDF-S) and obtained images in three near-infrared filters. The resulting images reveal extremely distant galaxies, which appear at infrared wavelengths, but are barely detected in the deepest optical images acquired with the Hubble Space Telescope (HST). Astronomer Marijn Franx from the University of Leiden and leader of the team concludes: "These results demonstrate that very deep observations in the near-infrared are essential to obtain a proper census of the earliest phases of the universe. 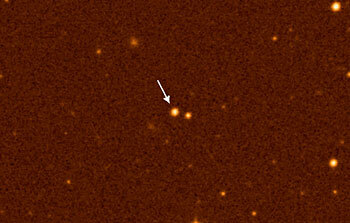 The new VLT images have opened a new research domain which has not been observationally accessible before". 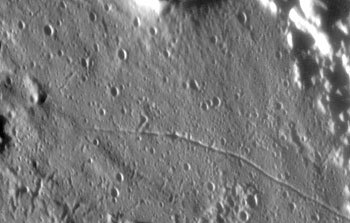 The HDF-S is a tiny field on the sky in the southern constellation Tucana (The Toucan) - only about 1% of the area of the full moon. The NASA/ESA Hubble Space Telescope (HST) observed it with a total exposure time of about 1 week, yielding the deepest optical images ever taken of the sky, similar to those made earlier on the Hubble Deep Field North (HDF-N). 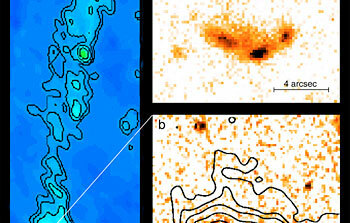 The VLT infrared images of the same field were obtained in the course of a major research project, the Faint InfraRed Extragalactic Survey (FIRES). They were made at wavelengths up to 2.3 µm where the HST is not competitive. 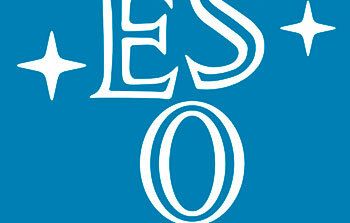 7 December 2002: ESO Video Clip is issued on the web in conjunction with the release of a 20-min documentary video from the Final Event of the "Life in the Universe" programme. This unique event took place in November 2001 at CERN in Geneva, as part of the 2001 European Science and Technology Week, an initiative by the European Commission to raise the public awareness of science in Europe. 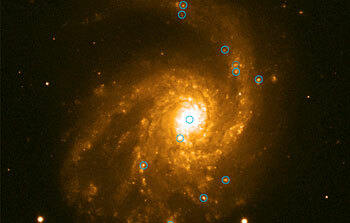 25 November 2002: Astronomers have released a new infrared image of the jets in the radio galaxy 3C 445, an active galaxctic nucleus. This highly detailed image, taken with ESO's Very Large Telescope, shows the extremely powerful processes taking place in such objects. 4 November 2002: Last year, seven of Europe's leading intergovernmental research organisations set up a high-level co-ordination and collaboration group, known as EIROforum. They include CERN (particle physics), EMBL (molecular biology), ESA (space activities), ESO (astronomy and astrophysics), ESRF (synchrotron radiation), ILL (neutron source) and EFDA (fusion). All of them have powerful research infrastructures and laboratories which are used by an extensive network of scientists. Together, they represent European spearheads in some of the most crucial basic and applied research fields. 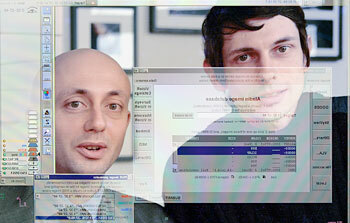 31 October 2002: Visit http://www.cern.ch/sci-tech on 7 - 8 November to find out what modern Europeans can't live without. Seven of Europe's leading Research Organizations  are presenting three live Webcasts from CERN in a joint outreach programme for the European Science and Technology Week . The aim of Sci-Tech... couldn't be without it! is to show how today's society couldn't be without cutting-edge scientific research. 30 October 2002: A faint star in the southern Milky Way, designated HE 0107-5240 , has been found to consist virtually only of hydrogen and helium . It has the lowest abundance of heavier elements ever observed , only 1/200,000 of that of the Sun - 20 times less than the previous record-holding star. This is the result of a major ongoing research project by an international team of astronomers . It is based on a decade-long survey of the southern sky, with detailed follow-up observations by means of the powerful UV-Visual Echelle Spectrograph (UVES) on the 8.2-m VLT KUEYEN telescope at the ESO Paranal Observatory in Chile. This significant discovery now opens a new window towards the early times when the Milky Way galaxy was young, possibly still in the stage of formation. It proves that, contrary to most current theories, comparatively light stars like HE 0107-5240 (with 80% of the mass of the Sun) may form in environments (nearly) devoid of heavier elements. Since some years, astronomers have been desperately searching for stars of the very first stellar generation in the Milky Way, consisting only of hydrogen and helium from the Big Bang. None have been detected so far and doubts have arisen that they exist at all. The present discovery provides new hope that it will ultimately be possible to find such stellar relics from the young Universe and thereby to study "unpolluted" Big Bang material. 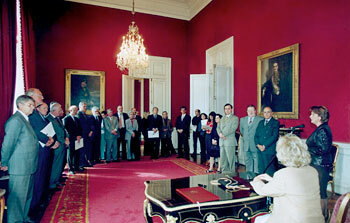 23 October 2002: On October 21, 2002, the Minister of Foreign Affairs of the Republic of Chile, Mrs. María Soledad Alvear and the ESO Director General, Dr. Catherine Cesarsky , signed an Agreement that authorizes ESO to establish a new center for astronomical observation in Chile . 26 September 2002: During the nights of September 15/16 and 16/17, 2002, preliminary tests were successfully carried out during which the light beams from all four VLT 8.2-m Unit Telescopes (UTs) at the ESO Paranal Observatory were successively combined, two by two, to produce interferometric fringes . This marks a next important step towards the full implementation of the VLT Interferometer (VLTI) that will ultimately provide European astronomers with unequalled opportunities for exciting front-line research projects. It is no simple matter to ensure that the quartet of ANTU, KUEYEN, MELIPAL and YEPUN , each a massive giant with a suite of computer-controlled active mirrors, can work together by sending beams of light towards a common focal point via a complex system of compensating optics. Yet, in the span of only two nights, the four VLT telescopes were successfully "paired" to do exactly this, yielding a first tantalizing glimpse of the future possibilities with this new science machine. While there is still a long way ahead to the routine production of extremely sharp, interferometric images, the present test observations have allowed to demonstrate directly the 2D-resolution capacity of the VLTI by means of multiple measurements of a distant star. Much valuable experience was gained during those two nights and the ESO engineers and scientists are optimistic that the extensive test observations with the numerous components of the VLTI will continue to progress rapidly. Five intense, technical test periods are scheduled during the next six months; some of these with the Mid-Infrared interferometric instrument for the VLTI (MIDI) which will soon be installed at Paranal. Later in 2003, the first of the four moveable VLTI 1.8-m Auxiliary Telescopes (ATs) will be put in place on the top of the mountain; together they will permit regular interferometric observations, also without having to use the large UTs. 28 August 2002: A rare celestial phenomenon involving the distant planet Pluto has occurred twice within the past month. 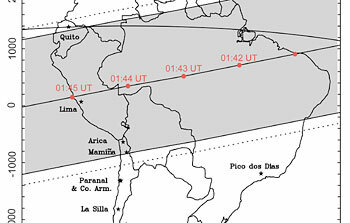 Seen from the Earth, this planet moved in front of two different stars on July 20 and August 21, respectively, providing observers at various observatories in South America and in the Pacific area with a long awaited and most welcome opportunity to learn more about the tenuous atmosphere of that cold planet. On the first date, a series of very sharp images of a small sky field with Pluto and the star was obtained with the NAOS-CONICA (NACO) adaptive optics (AO) camera mounted on the ESO VLT 8.2-m YEPUN telescope at the Paranal Observatory. 23 August 2002: Do very massive stars form in metal-rich regions of the Universe and in the nuclei of galaxies ? Or does "heavy element poisoning" stop stellar growth at an early stage, before young stars reach the "heavyweight class"? What may at the first glance appear as a question for specialists actually has profound implications for our understanding of the evolution of galaxies, those systems of billions of stars - the main building blocks of the Universe. With an enormous output of electromagnetic radiation and energetic elementary particles, massive stars exert a decisive influence on the surrounding (interstellar) gas and dust clouds . They also eject large amounts of processed elements, thereby participating in the gradual build-up of the many elements we see today. Thus the presence or absence of such stars at the centres of galaxies can significantly change the overall development of those regions and hence, presumably, that of the entire galaxy. A team of European astronomers  has now directly observed the presence of so-called Wolf-Rayet stars (born with masses of 60 - 90 times that of the Sun or more) within metal-rich regions in some galaxies in the Virgo cluster, some 50 million light-years away. 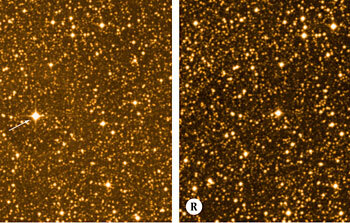 This is the first unambiguous detection of such massive stellar objects in metal-rich regions. 9 August 2002: Thirty-three years after the first manned landing on the Moon, the ESO Very Large Telescope (VLT) has obtained what may be the sharpest image of the lunar surface ever recorded from the ground . 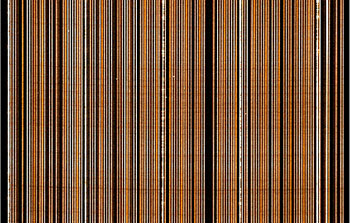 It was made with the NAOS-CONICA (NACO) adaptive optics camera mounted on the ESO VLT 8.2-m YEPUN telescope at the Paranal Observatory. 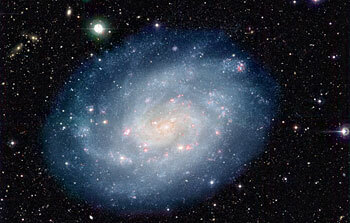 7 August 2002: A series of wide-field images centred on the nearby spiral galaxy NGC 300 , obtained with the Wide-Field Imager (WFI) on the MPG/ESO 2.2-m telescope at the La Silla Observatory, have been combined into a magnificent colour photo. These images have been used by different groups of astronomers for various kinds of scientific investigations, ranging from individual stars and nebulae in NGC 300, to distant galaxies and other objects in the background. This material provides an interesting demonstration of the multiple use of astronomical data, now facilitated by the establishment of extensively documented data archives, like the ESO Science Data Archive that now is growing rapidly and already contains over 15 Terabyte. Based on the concept of Astronomical Virtual Observatories (AVOs) , the use of archival data sets is on the rise and provides a large number of scientists with excellent opportunities for front-line investigations without having to wait for precious observing time. In addition to presenting a magnificent astronomical photo, the present account also illustrates this important new tool of the modern science of astronomy and astrophysics. 8 July 2002: The first observations of stellar spectra have just been performed with the new GIRAFFE multi-object spectrograph on the ESO Very Large Telescope (VLT) at the Paranal Observatory in Chile. This milestone event was achieved in the early morning of July 3, 2002. It signifies another important step towards the full implementation of the extremely powerful Fibre Large Array Multi-Element Spectrograph (FLAMES), one of the main instruments for the ESO VLT. This project is co-ordinated by ESO and incorporates many complex components that have been constructed at various research institutions in Europe and Australia. The GIRAFFE spectrograph provides unique possibilities for detailed observations of the properties of individual stars located in our Milky Way galaxy ( PR 16b/02 ) as well as in other galaxies of the Local Group.